Substitute Romelu Lukaku marked his return from a month on the sidelines through injury with a late winner against West Ham to breathe much-needed life into Everton. The on-loan Chelsea forward will also be looking for it to give his form a lift as it was his first goal since the end of December which gave his side a 1-0 win. 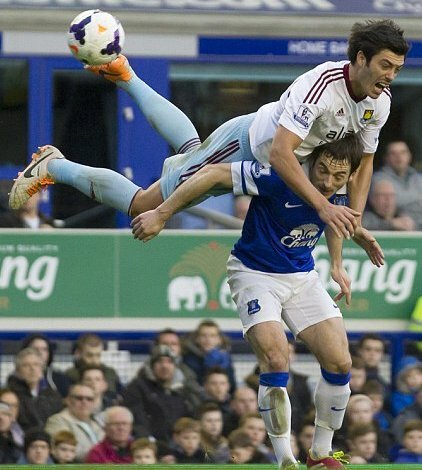 He was on target for the Toffees on his debut at Upton Park back in September, prompting a run of eight in nine games. Since then the well has run dry with just that single goal four days after Christmas, but manager Roberto Martinez insisted this week the player's enforced break with an ankle injury sustained in the Merseyside derby had given the Belgium international chance to rejuvenate himself. Surprisingly he did not start the match and was held back for an hour by Martinez, but he proved his manager's pre-match assessment was not just empty words with a first-time strike in the 81st minute. It was perhaps fitting a striker should decide what was, in the majority, a rather turgid affair on the 34th anniversary of the death of Goodison's greatest goalscorer Dixie Dean. With his loan spell due to end in three months, and no prospect of a permanent stay so far, Lukaku will never match Dean's record of 383 goals in 433 appearances, but this strike was an important one as the Toffees had failed to score in three of their last four league matches and had won just twice since the turn of the year. That run has seen them drop well off the pace for Champions League contention but this result will give them a much-needed lift. Up to the goal being scored, the major talking point was referee Jon Moss' assessment that Gareth Barry had not fouled Kevin Nolan just as the West Ham captain looked to be clean through on goal in the first half. A red card at that point may have changed the outcome, especially with West Ham having won their last four and with four clean sheets in their last five games, and manager Sam Allardyce was visibly aggrieved at the decision. Everton, who have lost once in 21 league games at home, struggled to trouble goalkeeper Adrian, with only Steven Naismith's angled strike and Gerard Deulofeu's weaving run through the Hammers' massed ranks to shoot narrowly wide genuinely threatening. With the hosts coming up against a barrier - both physical and mental - in the final third, it seemed both sides were happier counter-attacking. But when Carlton Cole flicked on a ball to Nolan, exploiting a space between the centre-back pair of Sylvain Distin and John Stones, deputising for the injured Phil Jagielka, Barry appeared to have both arms around the Hammers captain's midriff before he went to ground on the edge of the area, although Moss waved play on. The introduction of Andy Carroll, on for an injured Carlton Cole, saw West Ham raise their game as they started to dominate the physical battle. Steven Pienaar came closest to scoring less than two minutes into the second half when Leighton Baines teed him up for a low shot from the left of the penalty area, but Adrian did enough to tip it on to the post and then recover to claim Deulofeu's rebounded effort. Pienaar did not do so well with Baines' next pass, looping a shot over the crossbar, while Carroll forced Howard to tip over a rasping left-foot effort from distance after Stone's poor touch and drilled over another powerful half-volley. Lukaku finally made his return on the hour and Aiden McGeady arrived 10 minutes later, but they struggled to add any life to Everton up front. That was, however, until eight minutes from time, when Baines' cut-back picked out Lukaku on the penalty spot and he rammed home left-footed. Energised, the Belgian was narrowly over with a volley on the turn but he had already done enough.